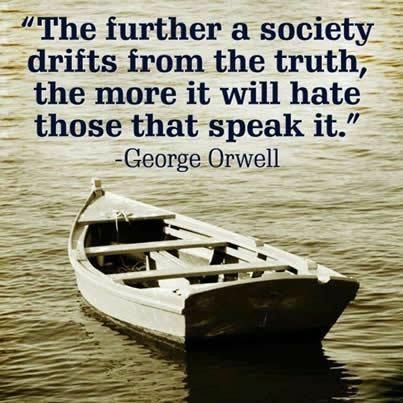 We are not drifting away from the truth. We are motoring away from it at maximum speed. #BLOTUS and the current administration is using Orwell’s 1984 as a playbook. We must not stop speaking the truth. Our survival as a democratic nation depends on it. This entry was posted in Hunger & Poverty, Quotes and tagged 1984, administration, BLOTUS, democracy, drifting, full speed, George Orwell, hate, playbook, quote, society, speaking out, truth on March 5, 2018 by Ray Buchanan.